While basal cell carcinoma (BCC) remains the most common skin cancer, the incidence of metastasis is rare. 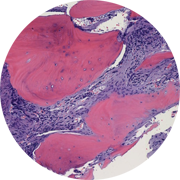 We present a case of metastatic basal cell carcinoma extensively involving the bone marrow in a patient with history of basal cell carcinoma, infiltrative subtype. Clinical assessment shows no indication of neoplasm present in other sites/organs. Bone marrow core biopsy shows sheets of neoplastic epithelial cells. Areas of nesting and peripheral palisading are noted. No residual hematopoietic elements are seen. The neoplastic cells are positive for CK5, CKAE1/AE3, BerEP4, PIN4, p63, and CD56. The neoplastic cells are negative for CK7, CK20, and EMA. The immunophenotype is consistent with the diagnosis of metastatic basal cell carcinoma.